1. Soak the chikpeas in water overnight or for 6- 8 hours. 2. In a vessel add water and cook till the chikpeas become tender. You can also use a pressure cooker, with a time limit of 1 whistle.Remove aside the cooked chikpeas. 4. Add the cooked chikpeas, salt, coconut and saute for few minutes.Add a dash of lemon juice if needed. The water or stew of cooked chikpeas can be used in a curry or soups. What happens when you want to have a good authentic Indian breakfast/lunch/dinner and with a condition of not having the dish loaded with carbs? The answer is Lentil Dosa!! !, thats what struck me. During college days, Mom used to keep a lot of lentils in powder form which used to be mixed with water and make the ghavane which is similar to dosa, so that it was easier to prepare the breakfast early mornings. Coming back to the low carb diet, I make use of the lentils along with the rice and they make a delicious and nutritious breakfast! 2. Grind these to a smooth batter. Add salt. The consistency of the batter is important in making the dosas, it shouldn't be of very thin consistency. 4. Heat a non-stick pan, take a ladle full of the batter and spread it on the pan in circular motion to make thin dosas. Apply oil on the sides, or use oil spray. 6. Cook on both sides, if desired. 7. Serve hot with chutney/potato bhaji /sambar. 1. Thinly slice the bitter gourd and remove the seeds if any. Add salt and leave aside for 5 -10 minutes. Then rinse with water. 2. In a bowl, mix the chilli powder,coriander powder, tamarind pulp, asafoetida, turmeric, salt. Add very little water if needed and mix. 3.Add the slices of bitter gourd to the above mixture and mix well so that they are coated with the seasoning. 4. Heat a frying pan, add a little oil or spray. This past weekend, had been to one of the korean stores. Usually go there to get some of the tropical veggies or rather just to see if we could get the vegetables that we used to eat while growing up, vegetables like amaranth, dill, raw jackfruit, bamboo shoots....and lots more.... But the one that took ours and lot of other people's attention was this dark pink fruit...the label read..Dragon fruit (also called pitaya). I had a sports drink which was dragon fruit flavored, but had never seen this fruit..did not even search it on the internet. So bought this fruit. It is wonderful to just look at it too. Got home, cut it into two parts and it resembled the kiwi fruit with tiny little black seeds. Scoop the pulp/flesh. We ate 1/4 part as it is, and the remaining, blended with 1/2cup of water and 1 tsp sugar. Loved it!!! White rice is good (I dont want to put it down cos I love it !) but brown rice is that much better and healthy too. So, making a healthy breakfast, the first thing that crossed my mind was to make brown rice idli, a healthy, nutritious and delicious breakfast. The combination of urad dal(highest protein content legume) and brown rice was a good one and must say they were soft, fluffy, and tasting great! a better option of eating brown rice. 2. Drain the water and grind the urad dal to a smooth consistency(use very little water), remove the batter. 3. Then grind the brown rice with 3/4 cups of water to a smooth consistency. 4. Mix well the urad dal and rice batter. Add yogurt, baking soda and mix. Keep the batter covered,place it in a warm place for about 8 hours or overnight. 5. When time to cook idli's, add salt to the batter and mix. Apply little oil to the idly plate, Pour the batter onto the idly plate and steam for 10 - 15 minutes. 6. Remove the idli's and serve with favorite sambar or chutney. We had it with matki patal bhaji , tasted great! Note: I used brown basmati rice. Traditionally the idli's are prepared with white idli rice or parboiled rice. During winters, when keeping the batter overnight for fermenting, keep it in a steel vessel with lid closed. Leave the vessel in the oven with lights on. 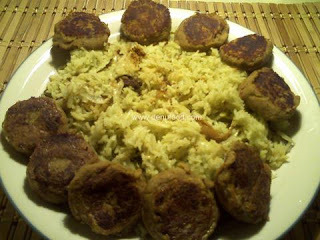 Shami Kabab is one of the lucknowi/moglai cuisine speciality. No claims about originality since we have made little changes according to our needs., i.e., we did not add eggs and did not deep fry it, two things which the original recipe calls for. 1. Grind all the dry masala/spices into fine powder. I used coffee grinder. 2. 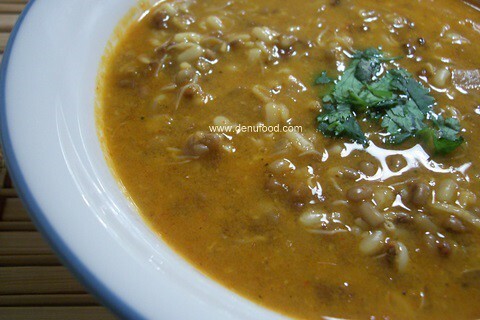 In a large vessel add chicken, chana dal, onion, ginger garlic paste, salt, and the above ground masala. Add water and let it cook for 30 - 40 minutes or until about there is very little water (less then 1/2 cup) of water remaining in the vessel. 3.Once cooked, grind mixture to fine thik paste. 4. Make small balls and flatten them. 6. It is usually served with mint chutney, we prefer with nan or rice. If using eggs, add the eggs in step 3 and knead the mixture, and follow the procedure from 4 to 6. You can also dip the kababs in whiskend egg and then shallow fry or deep fry. This is another simple, easy and quick dish belonging to my favourite tava fry category. The dish is also similar to Bhindi Di Pyaza, but since i use green chillies, I do not use any spices or masala, it is just the way of saying ..... the simpler the better. 1. Wash the bhindi/okra and pat it dry with a kitchen paper/towel or leave them to dry. This is to reduce the stickiness/sliminess while cutting the okra, then chop. 2. Heat oil in a pan, add onions and green chilles and saute for 2 -3 minutes. 3. Add the chopped bhindi and saute. 4. Then add turmeric, salt, tamarind pulp and garam masala (I did not use though) if needed. .
4. Keep the heat at medium to high and saute for 10 minutes or until the okra is cooked. 5. Serve as a side or with chapati. Make sure the okra, cutting board, knife are all dry before you cut the okra. Cooking on medium to high heat helps in removing the stickiness/sliminess.. I like the crunchiness of this dish, but if you want the vegetable to be soft, cover the pan and cook. Denufood - The name combines the first two letters of the two words - delicious and nutritious ! Denufood - Delicious and Nutritious Food Receipes from our kitchen, features the flavors of regional Indian cuisine, international cuisines and featuring Vegan,Vegetarian, Non-Vegetarian, Sea foodrecipes! Come share and enjoy some of quick, simple easy recipes! We have been part of Belgaum, Mumbai, Goa in INDIA and currently located in Maryland, USA. And being part of Belgaum which is border to Maharashtra and Goa, the food is influenced by the humble cuisines of North Karnataka, Maharastra & Goan/Konkan. Dedicated to our parents & grand parents ! Come share and enjoy some of the receipes from our kitchen!! We always make this as an appetizer/starter or at times when its a dieting time :-). Back home we use to make this during Nagapanchmi and mix it with lahya(puffed millet/jowar). I've used the chikpea of bengal gram variety. We also call it as harbare. 1. Soak the chana/bengal gram/chikpeas in water and leave it overnight. Drain water before cooking. 2. In a pan, heat oil and add mustard seeds. As the mustard seeds start popping add, cumin seeds, curry leaves, choppd onions and greeen chillies. Saute. 3. Add the chikpeas, a cup of water and cook the chikpeas with lid covered. Do not overcook, it just needs to be soft enough. 4. Once cooked, add salt and cumin powder and mix well/saute till the water is all used up. 5. Add grated coconut and cilantro for garnish. This is my entry to the My Love affair with Legumes-Fifteenth Helping and invited by The well seasoned cook. Let me decipher what Hirvi Kobi Tava Bhaji is..Hirvi means greeen, kobi is cabbage, tava/tawa is pan or griddle, bhaji is vegetable. I had the last quarter of the cabbage head lying in the fridge since couple of days, so thought to go ahead with it. This tawa bhaji, I guess is the most simplest with ingredients as well as preparation is concerned and so one of the favourite quick dishes!!! The green color of the dish is from the generous use of cilantro or coriander leaves. 1. Heat oil in a pan and add mustard seeds. As the seeds start to pop add the finely cut green chillies. Saute for a 1/2 min. 2.Immediately add the thinly sliced cabbage and saute for about 5 mins on little over medium flame. 3 Add cilantro/corriander and salt and stri fry for another 2 - 3 minutes. 4. Serve with chapati/roti or a loaf of bread. Can also have it as a side/salad. Note: Do not use water in this dish and do not cover the pan anytime during the sauteing, or after the dish is done. This is to maintain the crunchiness of the sliced cabbage. I started making this daal as a part of the Naivaidya/Prasad on tuesday evenings as part of fasting ritual. So this has been a regular in our kitchen. However there are other types of varan that we make and will share those in the upcoming posts! 1. Wash the lentils and transfer it in a vessel. 2.Add 3 -4 cups of water and cook the dal till it becomes soft. This should take anytime between 10-20 minutes but make sure the liquid doesnt overflow. 3. Add the tomatoes and cook for another 5 minutes. Check for the consistency, add water if needed. 4.Then add salt, turmeric, black pepper powder and keep the vessel on the lowest heat setting. 5. In another pan, heat oil, add mustard seeds. Once they start to pop add green chillies, cumin seeds and asafoetida. Immediately transfer this seasoning mixture into the vessel with cooked lentils and close the lid on the vessel. 6.Add a little water to the seasoning pan and transfer it to the lentil mixture. This is done so that there is no seasoning mixture left behind and the curry has all the aroma of the seasoning. 7. Garnish with ghee and cilantro.Serve with hot plain rice or as a soup.